This is a really feature rich audio player, i was using deadbeef for a little while but back to quodlibet. Imo best audio player there is in the gnu/linux world. If you exit the application part way through a song, will it resume where it left off when restarted? I've just set Quodlibet up and you are right. It is pretty damn good. Why do you prefer it to deadbeef? I just prefer quodlibet more as it has features im familiar with and doesn't need to be configured as much as deadbeef. To be honest I found deadbeef frustrating to set up and get most of my collection onto where as quodlibet handled my well over 20k music library easily. Uses nodejs npm, im on arch linux and nodejs was already installed, just npm needed installing 5 megs with 3 deps. npm stands for node packaged modules. If I am allowed to answer this question even isn't been addressed to me. 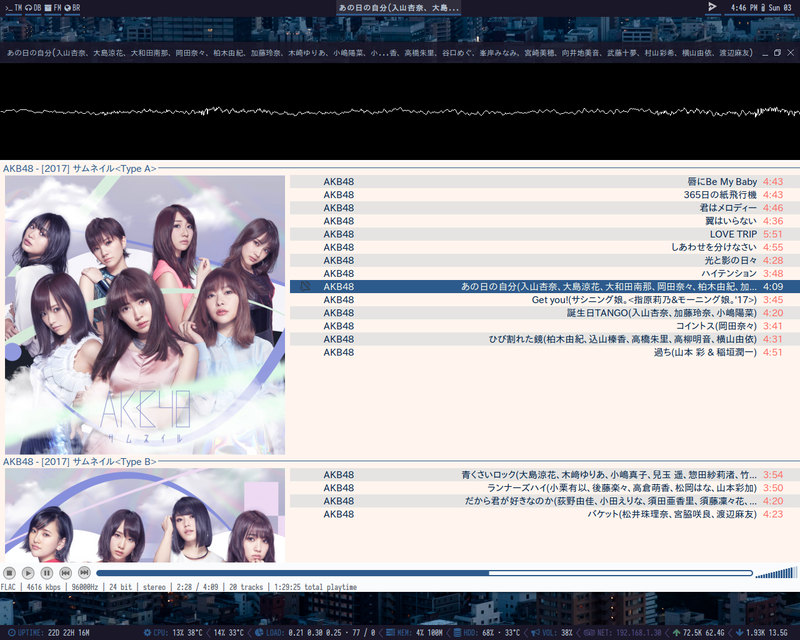 I use DeaDBeeF because for his similarity and imitation of Foobar2000 that is for me an ideal player on Windows. DeaDBeeF/Foobar2000 are unique on their kind to play Archive Audio files. I do not know the other player to do this without 3rd party addons/plugins. Could play very fine Hi-Res audio DSD/DSF as if it were FLAC/MP3. Support WAV Covers, while Foobar2000 supports WAV Tags editor. Have very good (default) settings to play Hi-Res 32bit WAV/FLAC 96kHz, 24bit FLAC 48kHz alone without the help of anything else 3rd party addon or plugin. May run as a binary portable mode without installing tons of library like many other players. Just extract the zip archive on your home and run it. Only 15MB space occupation take. Gives us the ability to play with UI. Is very lightweight, very minimal for a GUI. The second player in my row is Audacious, even this one walks in the footsteps of Foobar2000. An old scrot of my custom, night-mode & currently in use. DeaDBeef/Foobar2000 are highly interested for Audiophiles. These are just some features that i like about this player. If you have been an occasional user of Foobar2000, this and Audacious are the most common. Hi Nili, i could not get that function/plugin to work. The play audio via .rar file, maybe i didnt do it right or put the plugin in the correct place but it did not work. Can you let me know how it is done? Hi S7.L, Only ZIP Archive can be played without plugin, To play RAR we must have RAR vfs (scroll-down @ the bottom page). I'm sorry I should have separated the part of the RAR archive from ZIP, Zip doesn't need plugin. Just read how to put plugins from the "Installation page" on the right folder that you must create for plugins. it is usually "~/.local/lib/deadbeef/", just put on this path "vfs_rar.so", after having restart the player, the RAR archive will make the audio playable. Please write me back if it comes to play or not. Cheers Nili, not working for me atm. Ill figure it out another day and leave this thread alone, thanks for chiming in. Thanks for your answers guys re: deadbeef. I've happily used deadbeef myself for many years and currently use it on Solus Gnome. I will have a play around with Quodlibet. Thanks for the suggestion. My library is probably triple if not 4x (I've actually lost count) that size and it handles it nicely. 1tb of Metal scanned and added in about 10 minutes. It 's just a isolated issue with RAR plugin or neither plugin works at all? Try to open player from terminal to see if a warning notice appears. If it is just a path issue, this is easily adjustable. If you need anything else, do not hesitate to drop me a PM. Found out that foxit reader for android has a very nice method to reflow pdf files, works really well and i dont mind throwing some coin there way for this, they offer it free but with sign up to unlock extra features, but its the first app ive seen that has some truly unique and workable solutions for pdf files in small smartphones.